I don't usually take other bloggers to task on here, but every now and then I see something that I can't resist. In this case, it is a recent post by Fr. Dwight Longnecker entitled "Is Pope Francis a Liturgical Liberal?" Let me preface this by saying that I usually read Fr. Longnecker with delight and have no real bones to pick with him. I respect him and I offer this critique in the spirit of charity. That being said, I do have to call this one like I see it. Let's take a look at Father's article and I will offer my concerns. The point of Fr. Longnecker's article is to address concerns voiced by certain Traditionalists who are "grumbling" that Pope Francis may be a "liturgical liberal." Let's begin by keeping this thesis in mind: Father Longnecker's article poses the question, and he begins it by noting that some have accused Francis of being liberal liturgically, of being in favor of clown masses, puppets, balloons, etc. You know what I mean. "Everyone should stop and take a deep breath and get a sense of priorities. I am myself, on the more traditionalist side of the liturgy wars. I dislike anodyne, sentimental church music, a game show host style of priestly celebration, tacky day-glo vestments and the whole modernist dumbed down liturgical style. 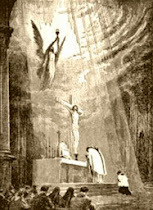 I’m all for the Spirit of the Liturgy and reverence and beauty in the liturgy. I’m down on big round churches, sloppy servers and feel good homilies in the style of a Hallmark card." "However, there are permissible variations in the way Mass is celebrated. Pope Francis may well turn out to be more “low church” and folksy in his style. That doesn’t mean he is going to ban the Latin Mass. He may be more informal and personable in his celebration of Mass. That doesn’t mean he’s going to send his liturgical police to confiscate all the lacy cottas and birettas in the world. Just because he wears a chasuble with grapes and wheat on it doesn’t mean he’s going to make everybody sing Eagle’s Wings every Sunday." Whoa! Who said anything about banning the Latin Mass or confiscating birettas or forcing a certain musical style? The initial question Fr. Longnecker set out to answer was whether Pope Francis himself is a liturgical liberal, not whether Pope Francis will try to force us to become liturgical liberals, or whether or not he will 'attack' tradition. I am not sure what traditionalist "grumbling" he was referring to at the beginning of his article, but as far as I know there is almost a universal consent among traditionalists and non-traditionalists alike that the Extraordinary Form is most likely safe, that Summorum Pontificum is not going anywhere, and that everything Benedict XVI did will remain in place. Fr. Longnecker is answering the question, "Whether Pope Francis come down on Catholic traditionalists", but the question he initially posed is "Whether Pope Francis is a liturgical liberal", which are two totally different questions. He is answering a question nobody asked. In the developing world however, the more informal modes of worship are much more of a general cultural phenomenon. An informal style there doesn’t necessarily carry all the baggage it does here. Just because a priest, bishop or pope is a bit more informal in his style of celebrating doesn’t mean he is a theological liberal or will compromise the faith. Indeed, everything about Pope Francis indicates that he is not only completely orthodox in theology and moral teaching, but that he has suffered for being so." Good points. In the United States, liturgical progressivism goes hand in hand with theological dissent; the two are virtually identical. But in Latin America, it is a bit different. When I initially complained about many of the liturgies I was seeing in Latin America, a friend of mine who had lived there simply shrugged and said, "That's the way they do it there." Fr. Longnecker points out that the fact that a prelate in Latin America prefers an "informal" and "folksy in his style" does not mean he is necessarily theologically heterodox. Therefore, "everything about Pope Francis indicates that he is not only completely orthodox in theology and moral teaching, but that he has suffered for being so." Well, fine, but we were not talking about whether Pope Franics is a theological liberal, heterodox, or whatever; we are not talking about theology, we were talking about whether or not Francis is a liturgical liberal, which again is a totally different question from whether or not he is heterodox. And, even if Latin Americans do prefer such liturgies, is that alright? Should we be happy about that? Fr. Longnecker seems to think it is no big deal, and by talking about the "permissible variations in the way Mass is celebrated", is he suggesting that the scandalous Latin American Youth Masses are just another "permissible variation"? I would hope not. "What strikes me about Pope Francis so far is that he celebrates Mass reverently and beautifully, but that his simplicity of life and his example of poverty means that he may not be as concerned about the “finer things” in Catholic worship. That doesn’t mean he’s going to ban everything that is beautiful, sacred and reverent. The give back with his informal style is that his preaching is heart felt and immediate." That is over the top, Father. Who suggested he is going to "ban" anything, let alone "everything" that is sacred or beautiful? Nobody is suggesting that or anything close to that. Why keep coming back to this question of "banning" and "outlawing" things? Can a person not be considered a "liturgical liberal" unless they are actively working to prohibit certain things? "The bottom line is this: it should not be a question of either good liturgy or faithful proclamation of the gospel. Indeed fine liturgy is an important part of proclaiming the gospel. However, if I had to choose between a happy clappy pope who was a vital and dynamic witness to the truth and beauty of the Catholic faith, and a liturgically “proper” pope who was a sour, self righteous hypocrite, I’d take the happy clappy pope every time." I am glad he recognizes that there is no real opposition between good liturgy and faithfully proclaiming the Gospel. But a hypothetical "happy clappy" pope whose offers liturgies that are questionable is by that fact not capable of being a vital and dynamic witness to the truth and beauty of the Catholic faith. 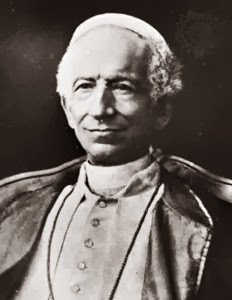 There is an intimate connection between the lex orandi and the lex credendi, and it is not reasonable to talk, even hypothetically, about a leader who is a "vital witness" to the "truth and beauty" of the Faith but who offers liturgies that are abominations. A liturgy is a witness to the truth and beauty of the Faith, and one who offers an ugly liturgy cannot simultaneously operate as a vital witness to the truth and beauty of the Faith. Similarly, who is he thinking of when he references a hypothetical self-righteous, dour pope? 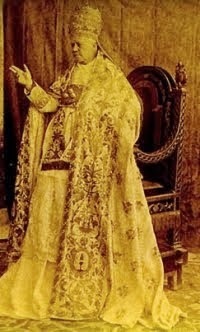 Benedict was the humblest and gentlest of men; ditto Pius XII, and again for Pius X. We certainly could have a pope who is liturgically proper but personally dour, but when is the last time that has happened? Not in recent times, at least. The threat of this happening is so nil that positing it as a hypothetical counter to bolster the desirability of a "happy clappy" by liturgically folksy pope is silly. 1) He posits the question of whether Francis is a liturgical liberal but then seems to restrict the definition of "liturgical liberal" to only those prelates who actively seek to suppress the Extraordinary Form and actively attack tradition. This is a very odd and narrow definition; I have never heard "liturgical liberal" defined as someone who actively and formally seeks to throw out tradition. That can certainly be one portion of liturgical liberalism, but that alone does not constitute liturgical liberalism. 2) He seems to admit of a bigger division between the lex orandi and the lex credendi than is prudent. 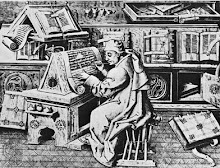 When he comments that clown masses, puppet masses and all sorts of this nonsense common in Latin American Masses (as here in this now famous video) have no bearing whatsoever on the theological orthodoxy of the ecclesiastics involved, he is positing a very radical separation between the lex orandi and the lex credendi, suggesting that the lex orandi can be manipulated and deviated from without any corresponding "baggage" to the lex credendi. Can't the lesson of the whole disaster since 1969 be summed up by saying we learned the hard way that you can't mess with the lex orandi without screwing up the lex credendi? This doesn't mean all who like "folksy" Masses are heterodox, but it means that heterodoxy is more likely to spring up in places where the lex orandi is not respected, like in Latin America, where "folksy Masses" are the order of the day, and where liberation theology is rampant. 3) Fr. Longnecker points out that Pope Francis is not a theological liberal, and then acts as if this proves that he is not a liturgical liberal. The original question was whether or not the pope is a liturgical liberal, not whether he is theologically heterodox. Simply consoling us that the pope is not heterodox (which nobody said he was) does not vindicate of the charge of liturgical liberalism. Fr. Longnecker has failed to answer the question he posed. Can it be the question is too painful to answer? It is not my intention here to answer the question of whether Pope Francis is a liturgical liberal. But there does seem to be confusion on exactly what a liturgical liberal is. Liturgical liberalism does not mean one must necessarily work to overthrow or outlaw the Extraordinary Form or traditional garments, practices, etc., nor does liturgical liberalism equate to theological heterodoxy, though the two do bear some relation to one another. Some time ago, I wrote an article challenging a priest who had published a similar argument with regards to communion in the hand; to a woman who asked whether communion in the hand was direspectful, the priest answered by saying communion in the hand was not a mortal sin. I said this was a straw-man argument and called it as such. Here we have the same argument: Fr. Longnecker asks whether Francis is a liturgical liberal and answers by saying he will not ban the Traditional Mass and is not a heretic. Again, I respect Fr. Longnecker and mean him no offense by questioning him here, but I don't think his article really got to the heart of the problem. "I usually read Fr. Longnecker with delight and have no real bones to pick with him." "[...] everything Benedict XVI did will remain in place." Except the altar in St. Peters! "Indeed, everything about Pope Francis indicates that he is not only completely orthodox in theology and moral teaching [...]"
Oh, really? Everything? This is simply not true. See: picture of him kneeling and getting blessed by some silly type of protestant. "[...] his simplicity of life and his example of poverty means that he may not be as concerned about the “finer things” in Catholic worship." Did Fr. Longenecker use the right word here? It seems he should rather have replaced "Catholic" with another "his"! 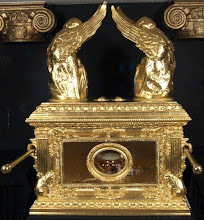 What saint or holy person, ever, has, because of their own humility, simplicity, or poverty, "confused" that with "not being concered" about the "finer things" in WORSHIPPING GOD? It's barely been a week and I am beginning to hate the word "humble". It's like "dialogue" and "pastoral" all over again. Also, a point of clarity; Regarding the picture you speak of, apparently what happened was Bergoglio knelt to receive a blessing from Fr. Cantalamessa, and I guess the Protestant put his hand on the Cardinal's head and blessed him of his own initiative without Bergoglio knowing it was going to happen or asking for it. I still think he should not have been there in the first place, but that is what happened. Come on. You're not a stupid person and we both know what that post is hinting at, even though it "officially" stays neutral. But what is neutral when the Bishop has condemned etc etc - you know all of this. A even nominally prudent man would have been very quiet about what he'd seen. That post is nothing but support for Medjugorje. Your clarification also makes me want to say "Come on." It happened, it's on picture. Did then Archbishop Bergoglio sent out an excuse to the Catholic faithful and explain the picture? No. It happened, some people have reacted, a weak excuse was made. These distinctions do matter. It matters tremendously whether Bergoglio asks to be blessed by a Protestant or whether the Protestant blessed him without his knowledge or approval; the distinction informs out judgment about what "it" is that happened exactly. I agree he should not have been there. I agree he should have offered an explanation. But you can't just say these sorts of distinctions don't matter. When we fail to recognize them, it makes us look bad. And, while believing in Medjugorje might mean you've allowed yourself to be duped, it doesn't mean you are heterodox. That's why even though I disagree with him on that I wouldn't hold that against him as if he were a dissenter or something. I didn't say that the distinction doesn't matter. I said that the event (blessing) coupled with the following lack of events (no (immediate) excuse) - that is, what actually took place, regardless of what explanation was put forward at a much later date - prove that not everything about Pope Francis "indicates that he is [...] completely orthodox in theology and moral teaching". There is a serious problem going around with people labeling Francis a Liberal. You touched upon the problem with your Lex Orandi, Lex Credendi comment but I'm trying to get people (especially traditionalists) to recognize and address the heart of the problem. The heart of the problem with labeling Pope Francis a Liberal is that they are using Benedict as the 'standard' of traditionalism. That's very misleading and erroneous because Benedict was not really a traditionalists in the proper sense. So all this 'fear' that Francis is tearing down all the 'progress' Benedict made is really bogus. 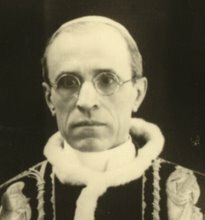 Benedict's Pomp, especially with dressing up the New Mass, was mistaken by Conservative Catholics and many Traditionalist Catholics as restoring tradition. That's inaccurate. The New Mass should be done with great respect, but dressing it up with traditional vestments does not have anything to do with restoring tradition. All that does is put us on the road to the dreaded Hybrid-Mass. Dressing up the New Mass to make it "Traditional" is really faux-traditionalism and reminds me of the "Lipstick on a pig" comment. So Pope Francis is not 'tearing down' all this hard work of Benedict. I prefer keeping the New Mass very respectful but not super decked-out so as not to confuse it with the Traditional Mass. If Benedict were ONLY a "Liturgical Traditionalist" (something impossible in light of Lex Oranidi, Lex Credendi, as you rightly noted), then he would have done things like forbade the 'experiments' of Communion in the hand and female altar boys. Other traditionalist things he could have done is forbade Chancellors from being laymen, spoken in plain terms about mortal sin, the reality of Satan, Confession, etc. But I don't really recall these things. I'm not here to bash Benedict at all, but it's sad that his homilies were often very 'academically' presented with leaving us up to having to read between the lines. Pope Francis' homilies so far are already showing some teeth. Understood. At any rate, it is Longnecker that said that, not me. I do give room to allow for prudential errors that don't necessarily imply heterodoxy. Nick, goods points. I would not say BXVI is a Traditionalist, but I would say he had us on a general trajectory towards Tradition - and freeing up the old Mass was a huge thing. It is not that BXVI was "traditionalist", but that he had us on a path towards liturgical excellence that now we might deviate from. I do agree that one great thing about Francis is the bluntness of his speech; I have often complained on here of the verbosity of Magisterial documents. Hopefully, Francis will simply call it like it is. I too am confused by the unlimited praise traditionalists grant Pope Emeritus Benedict XVI after his abdication. He was a child of the Second Vatican Council at its best, but a child of the Council none the less. James Larson's brilliant and ongoing article-series War Against Being (www.waragainstbeing.com) documents just how far his heterodoxy goes. Have you read it, Boniface? Alas, Pope Francis' terseness, while refreshing, is no indication of a richer whole. His speeches are, so far, very much hit and miss. 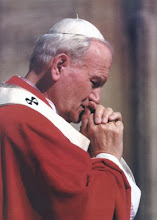 See his Address to the Diplomatic Corps - as documented on Rorate-Caeli: http://rorate-caeli.blogspot.com/2013/03/pope-no-true-peace-without-truth.html - to balance out the one given to the Cardinals. I have read some of it, but its been awhile. Yes, the thing about everything Francis does is it has the potential to be really good, if the content is good. 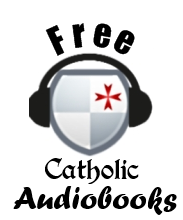 "here we have a pope who will not communicate in 95 page encyclicals full of philosophical jargon, but who is capable of truly speaking plainly and directly, which is something the Church sorely needs. If the pope can employ this candor in the defense of truth, he will quickly become the scourge of the progressives and will teach the truths of the faith very clearly. I don't see any problem with trying to bring more reverence into the NO or incorporating elements of the EF into it...anything like that done to the NO could only benefit it. I would think the only problem would be things going the other way, from the NO into the EF. That would be the dreaded hybrid. But I don't mind seeing the NO "dressed up." A dressed up NO, while not the EF, is better than a dressed down NO. I attend a dressed up NO Mass regularly. I think the real problem is mixing the other way. I do think Fr. L has a point when he equates liturgical liberals with those who want to impose-on and ban things. The p-t-r-t, people-that-run-things, ran roughshod over the laity to give us 'the spirit of V II'. They achieved their reforms by bullying.. recall the penultimate GIRM's restrictions on kneeling for Communion, and how those who dared to kneel were to be called out and 'catechized'. Conservatives consider Pope Francis as a man absent integrity; that is, they think that as Pope he will act differently than he did as Abp. It really is not a flattering portrait of how they think of him. They, apparently, did not think that what he did in the past was genuine. 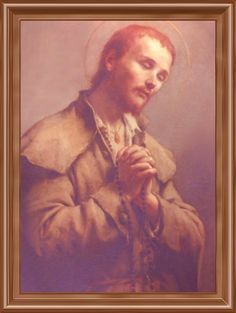 The sad reality is, however, that he will transform the Papacy and the Papacy will not transform him - that is how it works since Pope John 23rd. Wow! Why is is that anything about Pope Francis gets back to bashing Benedict XVI? Benedict XVI, Pope Emeritus, deserves our praise for what he did in regard to the liturgy. My comment is actually about this article. ;) I think it's terrific and your critic is spot on! I agree with you completely, Boniface! Attempts to ban traditional liturgical practices is a sign o liturgical liberalism, but not all liturgical liberals try to ban things. Very good analysis, Boniface, and I agree with pretty much everything you said. I usually don't read Fr. Longnecker as I think he's somewhat typical of a convert from a Protestant denomination ~ not entirely getting the whole Catholic-thing through and through because, well, he was an Anglican until recently. A few years ago on a traditional blog, he was promoting a pilgrimage to Italy that I inquired into. I explained that I was a traditional Catholic and wondered if he would be offering for the pilgrims the Traditional Mass. He responded that, no, he wouldn't because he doesn't know how to say it yet. An honest answer which told me that this pilgrimage wasn't for me. He then attempted to convince me that I would love the trip anyway because they'd be visiting several monasteries where I'd "get to hear some Latin in parts of the Mass". I explained that I wasn't looking for a Mass that had "some Latin", but the Traditional Latin Mass. I had the distinct impression that he thought that the issue was us folks who like to hear Latin and maybe throw in some incense and we'll be happy. Perhaps his understanding has expanded since then of what "traditional Catholic" means but as I say, I haven't read much from him since then.